EZDamp provides serial bus control of temperature chamber controllers from major environmental chamber manufacturers such as Thermatron or Wadlow. Custom temperature chamber controller modules can be developed for other controllers. EZDamp also reads the thermocouple located in the test chamber to assure that the desired temperature has been reached before the test is conducted. 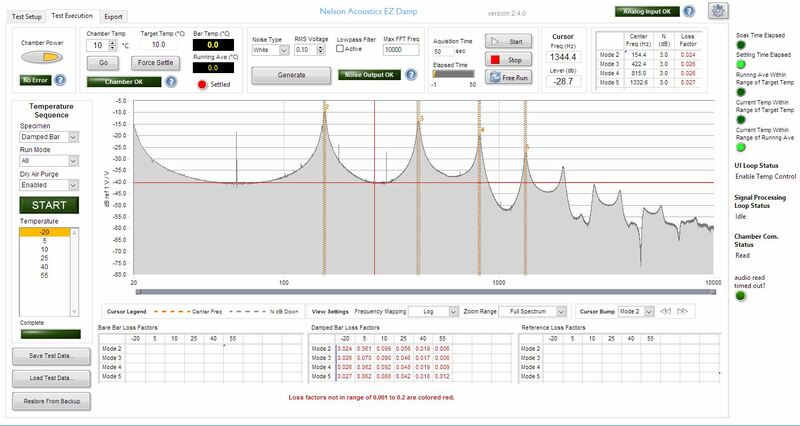 EZDamp provides a gain controlled noise excitation signal to the shaker that excites the test bar and reads the accelerometer output signal from the bar. The relationship between these two signals creates transfer function from which the material properties are derived. EZDamp provides automated control of the test, moving the test through each temperature that has been configured. Automated signal processing identifies modes and calculates damping factors for signals that have well defined mode shapes. Manual/visual control is provided for user interaction on signals that don’t have well defined mode shapes. EZDamp works with National Instruments signal acquisition and data acquisition hardware including the cDAQ USB NI9250/9260 devices, the PXI-4461 and the PXI-4463/4464 devices.